The blood stain left on the spot where the shareholder.who losed his cost at about 1.7million RMB by playing the stock market,jumped off a building and died at the end. The desperated shareholder surnamed Hou had posted one commentar in net before jumping off the building and the commentar spreads through the internet. None to be complained; All blames on my greed.I should have wanted to offer to my family the cose life,but now all is in nothing by losing all,Alas departure from my beloved family,bid the last farewell!" It is reported by interviewing the resident in the building and learned that the man had only one child and lived on the 22nd floor.Last two days (9th June and 10th June),the stock kept limit price for two days,only to cause the loss at all my principal.Then his wife kept quarrelling with him for more than one whole day and continued to do again,then the man could not bear the heavy burden and chosed to commit suicide. 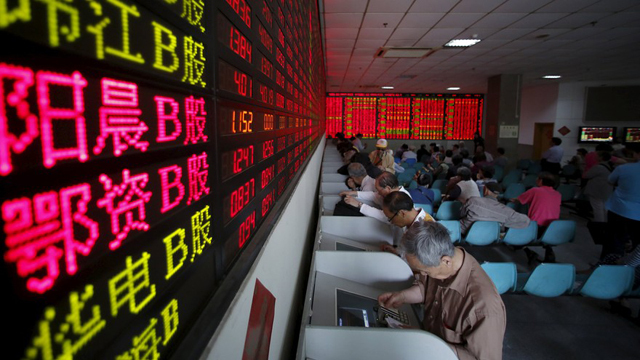 Stock market fever is sweeping China. Chinese equities are officially on fire. The Shanghai Composite has skyrocketed 78% since just before Halloween. It recently crested the 4,000 level for the first time since the financial crisis. Yet stocks in China have achieved red-hot status just as the country's economy is going through a cooling off period. Growth slowed to the weakest pace since 2009. In other words, exuberance for Chinese stocks isn't being backed up by fundamentals. Instead, the market is being carried higher by various forms of government stimulus and investor frenzy. All of this raises the question: Is China in the midst of a bubble? And if it is, what should American investors do? "Certainly a bubble exists," said Ankur Patel, chief investment officer at R-Squared Macro Management. Rather than enjoy the ride up or try to profit from its eventual popping, Patel said the prudent move for U.S. retail investors is to stay away from the Chinese market altogether. "The problem with any bubble is if you try to bet against it, bubbles can become even more irrational. The herd mentality can essentially run investors over," he said.